RDM not only brings our clients’ ideas to life, but we also prove the invention’s functionality. With the Quick-Knot project, our team of engineers designed a complete testing apparatus that closely simulated a fish strike for a product designed to secure fishing hooks to lines. 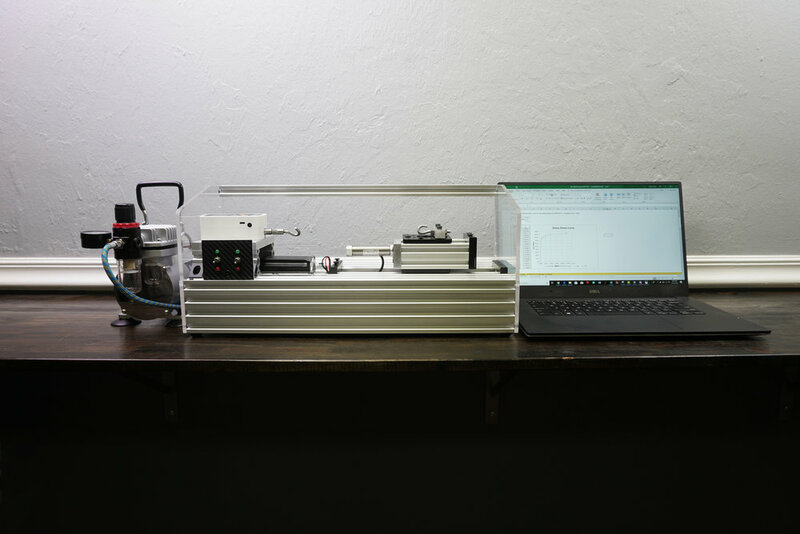 This equipment allowed us to test competitors’ products alongside Quick-Knot and perform statistical analysis to prove its ability to function under real world circumstances . This equipment’s frame was built with extruded aluminum and is a modified version of industrial material tensile testers. Featuring a high torque ball screw, the machine can test braided, monofilament, and fluorocarbon lines up to 100 pounds. All our testing equipment is certified for accuracy to ensure that all gathered test data and results are accurate before being presented to our customers. Not only was this device used for product verification, but it can also be implemented during manufacturing as a quality assurance step, doubling its utility. With access to extensive industrial analysis software, the test engineers at RDM modeled stress-strain curves for the Quick-Knot product. These data allowed us to make informed decisions and changes to the prototype design as needed. By keeping all testing activities in-house, we quickly generated a functional product that met every design requirement.